9. Satan floods the world with false Bible versions. A. Since persecution had not been very successful, the devil tried another tactic: perverting the word of God. B. He experimented with this tactic early on in the days of the apostles (2Co 2:17). 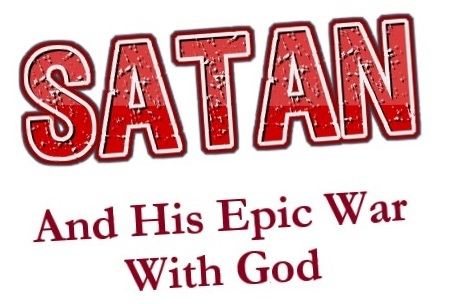 C.	Satan began corrupting the scriptures in earnest in the second century. D.	Satan flooded the world with counterfeit Bibles. i. As the above quote shows, Satan flooded the world with perversions of the scriptures from very early in the history of Christianity. ii. It seems that in the mid-19th century Satan began to corrupt the English Bible using the Greek manuscripts that he corrupted centuries earlier. iii. There have been over 100 English "versions" of the Bible published since the 1880s that have flooded the world. iv. This could be the flood that serpent cast out of his mouth to carry away the woman (Rev 12:15). v.	The word of God comes from God's mouth (Pro 2:6; Isa 55:11; Eze 3:17). a.	Satan wants to be like the most High (Isa 14:14). b. It would follow then that the corrupted scriptures proceed out of Satan's mouth. c.	God's doctrine is as rain and dew upon the grass that causes it to flourish (Deu 32:1-2). d.	Satan's bibles instead come as a flood which destroys (Rev 12:15). vi. Satan's bibles are watered down versions of God's Bible. vii. The earth (the people of this world) helped the woman (the church) by accepting all of Satan's counterfeit bibles (Rev 12:16). i. The Septuagint is abbreviated as LXX. ii. It is a Greek translation of the Hebrew Old Testament. iii. The original Septuagint is said to have been translated by 72 Jewish elders in Alexandria, Egypt in the 3rd century B.C. a. "Its precise origins are still debated. A letter, purporting to be written by a certain Aristeas to his brother Philocrates during the reign of Ptolomy Philadelphus (285-246 B.C), relates how Philadelphus, persuaded by his librarian to get a translation of the Hebrew Scriptures for his royal library, appealed to the high priest at Jerusalem, who sent seventy-two elders (six from each of the twelve tribes) to Alexandria with an official copy of the Law. There in seventy-two days they made a translation which was read before the Jewish community amid great applause, and then presented it to the king. From the number of translators it became known (somewhat inaccurately) as the Septuagint. The same story is told with variations by Josephus, but later writers embellish it with miraculous details. iv. The original Septuagint is said to have been loved by the Jews and later used by the 1st century A.D. Christians to prove that Jesus Christ was the Messiah. a. In the 2nd century A.D., revisions were made to the Septuagint by Judaizers who wanted to remove the references which proved that Jesus was the Messiah. b. "Jerome of Bethlehem, who saw these Greek translations of Aquila, Symmachus, and Theodotian, makes it quite plain that these men were Judaizing heretics, and that their versions were made out of hatred to Christianity. "Before the birth of Messiah the Jews used to observe a feast in memory of the translation of the Septuagint. Philo the Jew, who lived in the time of Caligula the Roman Emperor, while the Apostles were fruitfully engaged in the preaching of the Gospel, tells us in his Life of Moses that to that time they kept a yearly feast in memory of the Scriptures having been translated into Greek by the seventy-two interpreters. After Philo's days, the Jews turned the feast into a fast, lamenting that such a translation had been made. As the version became more popular with Christians, it fell from favor with the Jews, who preferred to use a version which the Christians could not so easily apply to the Messiah. "As an example of their tampering with Messianic prophecy, in Isaiah 7:14 Aquila, Symmachus and Theodotian departed from the rendering of the Septuagint PARTHENOS (Virgin) and substituted NEANIS, a term which may be applied to "a young married woman." F.	In the third century AD, a man named Origen Adamantius of Alexandria, Egypt did much to corrupt the scriptures. i. His work formed much of the foundation for Bible corruption to the present day. b.	Origen was one of the infamous four. ii. Origen wrote a six-column version of the Old Testament called the Hexapla which contained the Hebrew OT, a few previous Greek translations of it, and his own translation. b. The fifth column of Origen's Hexapla became the Old Testament of the Roman Catholic Church commissioned by the emperor Constantine. c.	"(quoting from Wilkinson) "...As Constantine embraced Christianity, it became necessary for him to choose which of these Bibles he would sanction. Quite naturally he preferred the one edited by Eusebius and written by Origen. The philosophy of Origen was well-suited to serve Constantine's religio-political theocracy." "Kenyon says, "The Emperor himself instructed Eusebius of Caesarea, the great historian of the early church to provide fifty copies of the Scriptures for the churches of Constantinople; and the other great towns of the Empire must have required many more for their own wants." iii. Origen was "the leading Christian critic of antiquity" (Dr. Jack Moorman, Forever Settled, p. 70). a. An example of Origen's textual criticism is how he decided that Jesus' words "Thou shalt love thy neighbor as thyself" must have been added to Mat 19:17-21 because that commandment encompasses all of the law, and if the rich young ruler kept it then he would have been perfect, which, in Origen's mind, contradicted what Jesus said about him (Dr. Jack Moorman, Forever Settled, p. 70-71). (i)	Who inspired Origen to think this way and pervert the scriptures? (ii)	How about the first Bible critic who said in the garden, "Yea, hath God said..." (Gen 3:1)? G.	The King James Version (Authorized Version of 1611) was translated from the Greek Textus Receptus. i.	Textus Receptus is Latin for the "Received Text." ii. The Textus Receptus (TR) is representative of a group of manuscripts known as the Traditional Text, the Majority Text, the Syriac Text, and the Byzantine Text. iii. The TR was a printed Greek New Testament that was compiled by Erasmus in the early 1500s. iv. It was not a new version, but a printed Greek New Testament that was representative of 85% or more of the surviving 5000+ extant manuscripts of the N.T. that closely agree with one another. v.	The manuscripts underlying the TR originated in Syria where the apostle Paul was based out of (Act 11:26). H.	Nearly all modern English Bible versions published after 1881 were translated from the Westcott & Hort Greek NT (or the similar Nestle-Aland Greek NT or the United Bible Society Greek NT which succeeded it). i. The Westcott & Hort Greek NT. a. The Westcott & Hort Greek NT was published by two Anglican clergymen, Brooke Foss Westcott (1825-1901) and Fenton John Anthony Hort (1828-1892). b.	Westcott and Hort published their Greek New Testament in 1881.
c.	It was based heavily on two corrupt 4th century manuscripts named Vaticanus (B) and Sinaiticus (Aleph). ii. The Westcott and Hort Greek New Testament differs from the Textus Receptus in thousands of places. b. The KJV and the modern English versions are most definitely not translated from the same Greek Bible. iii. The two manuscripts (Vaticanus and Sinaiticus) underlying the Westcott and Hort Greek NT came from Alexandria, Egypt and either originated from, or were heavily influenced by, Origen (see quotes above). iv. These two manuscripts disagree with the Textus Receptus in thousands of places. a.	Vaticanus (B) - (discovered in the Vatican in 1448). (ii)	"B does not consider the following as part of the bible: Revelation, Phil., Titus, I and II Timothy, large parts of Samuel, Kings, Nehemiah, the Psalms, and Genesis. B omits crucial parts of Mark and Luke. In their place it adds apocryphal books such as Bel and the Dragon, Tobit, Judith, and the Epistle of Barnabas." (G.A. Riplinger, New Age Bible Versions, p. 551). (ii)	"There are about 9000 changes in this text from that of the Majority and Traditional Text, amounting to one difference in every verse. It omits some 4000 words from the Gospels, adds 1000, repositions 2000 and alters another 1000. It has approximately 1500 readings that appear in no other manuscript; this affects nearly 3000 words. The following omissions are just a few examples. •	The end of Mark and John. •	Thirty-nine words from Joh 19:20, 21; twenty words from Joh 20:5-6; nineteen words from Mark 1:32-34; fourteen words from Mark 15:47. •	John 5:4, Mat 16:2-3, Rom 16:24, Mar 16:9-20, 1Jo 5:7, Act 8:37, Gen 23:19-24, 46, Num 5:27-7:20, 1Ch 9:27-19:27. •	Exodus, Joshua, I and II Samuel, I and II Kings, Hosea, Amos, Micah, Ezekiel, Daniel, and Judges. •	In Luke 8, for example, 19 out of 34 words are changed. In Matthew chapter one, 60 words are changed. v.	Vaticanus (B) and Sinaiticus (Aleph) also disagree with each other in thousands of places. vi. It's not so much a matter of the modern Bible versions being inaccurately translated (they are), as it is that they were translated from corrupt manuscripts. I. The modern Bible versions (Satan's bibles) translated (or paraphrased) from the Westcott & Hort NT such as the New King James Version (NKJV), New International Version (NIV), English Standard Version (ESV), New American Standard Bible (NASB), American Standard Version (ASV), Revised Version (RV), New Revised Version (NRV), Living Bible (LB), New Living Translation (NLT), The Message (MSG), etc. attack the preservation of the scriptures, do violence to the Trinity, degrade Jesus Christ, corrupt the doctrine of salvation, remove condemnations of moral sins, and help to bring in a new world order. i. Note: the NKJV was supposedly translated from the TR, but it often follows the Critical Text in its text and its footnotes as will be shown below. ii. Satan's bibles (of course) attack God's promise to preserve of the scriptures and change verses that say that wicked men change verses. a.	Psa 12:6-7 (KJV) - The words of the LORD are pure words: as silver tried in a furnace of earth, purified seven times. 7) Thou shalt keep them, O LORD, thou shalt preserve them from this generation for ever. (ii)	(ESV) - The words of the Lord are pure words, like silver refined in a furnace on the ground, purified seven times. 7) You, O Lord, will keep them; you will guard us from this generation forever. (iii)	(NASB) - The words of the Lord are pure words; As silver tried in a furnace on the earth, refined seven times. 7) You, O Lord, will keep them; You will preserve him from this generation forever. (v)	(MSG) - God’s words are pure words, Pure silver words refined seven times In the fires of his word-kiln, Pure on earth as well as in heaven. God, keep us safe from their lies, From the wicked who stalk us with lies, From the wicked who collect honors For their wonderful lies. b. 2Co 2:17 (KJV) - For we are not as many, which corrupt the word of God: but as of sincerity, but as of God, in the sight of God speak we in Christ. (i)	(NKJV) - For we are not, as so many, peddling the word of God; but as of sincerity, but as from God, we speak in the sight of God in Christ. (ii)	(NIV) - Unlike so many, we do not peddle the word of God for profit. On the contrary, in Christ we speak before God with sincerity, as those sent from God. (iii)	(ESV) - For we are not, like so many, peddlers of God's word, but as men of sincerity, as commissioned by God, in the sight of God we speak in Christ. (iv)	(NASB) - For we are not like many, peddling the word of God, but as from sincerity, but as from God, we speak in Christ in the sight of God. (v)	(NLT) - You see, we are not like the many hucksters who preach for personal profit. We preach the word of God with sincerity and with Christ’s authority, knowing that God is watching us. (vi)	(MSG) - No—but at least we don’t take God’s Word, water it down, and then take it to the streets to sell it cheap. We stand in Christ’s presence when we speak; God looks us in the face. We get what we say straight from God and say it as honestly as we can. c.	Rom 1:25 (KJV) - Who changed the truth of God into a lie, and worshipped and served the creature more than the Creator, who is blessed for ever. Amen. (i)	(NKJV) - who exchanged the truth of God for the lie, and worshiped and served the creature rather than the Creator, who is blessed forever. Amen. (ii)	(NIV) - They exchanged the truth about God for a lie, and worshiped and served created things rather than the Creator—who is forever praised. Amen. (iii)	(ESV) - because they exchanged the truth about God for a lie and worshiped and served the creature rather than the Creator, who is blessed forever! Amen. (iv)	(NASB) - For they exchanged the truth of God for a lie, and worshiped and served the creature rather than the Creator, who is blessed [b]forever. Amen. (v)	(NLT) - They traded the truth about God for a lie. So they worshiped and served the things God created instead of the Creator himself, who is worthy of eternal praise! Amen. (vi)	(MSG) - And all this because they traded the true God for a fake god, and worshiped the god they made instead of the God who made them—the God we bless, the God who blesses us. Oh, yes! iii. Satan's bibles attack the Trinity. a. 1Jo 5:7 (KJV) - For there are three that bear record in heaven, the Father, the Word, and the Holy Ghost: and these three are one. (i)	(NKJV) - For there are three that bear witness [a]in heaven: the Father, the Word, and the Holy Spirit; and these three are one. a. NU (Nestle-Aland / United Bible Society texts), M omit the words from in heaven (v. 7) through on earth (v. 8). Only 4 or 5 very late mss. contain these words in Greek.